May 5, 2018 . . . What a busy Saturday for The Chef In Pearls! I had so many things on my plate. I just prayed I would be able to pull it all off. I was chosen to be a judge for Taste of Conyers. How cool was that? Tré cool, if you ask me. I would get a second chance to find out more about my small town. Excited I was (in my Yoda voice). Then there was the event that was very close to me. My family, along with One Heart Ministries, hosts a community event to bring awareness to cancer in memory of my bonus Dad, Raymond Brown. I was the unofficial official chef for the event. Anything my family does know that there will be food involved. Game plan. Adorn one of my black aprons and get the food done. Shower, get dressed and head to Olde Town Conyers for Taste of Conyers. Meet up with other bloggers/judges. Meet and judge participants for Taste of Conyers. Discuss and tally vores with fellow bloggers/judges. Leave Taste of Conyers and head to family event. Be present. Participate in games and activities. Go home and rest. What actually happened. Adorned apron. With the help of a few friends, we were able to knock out over a hundred burgers, 25 lbs. of potato salad, 2 full trays of coleslaw and get 21 whole chickens portioned and cooked. Very tired and rather slowly I got showered, dressed and headed to Olde Town Conyers. Problem. Can’t find any parking. Miss meeting fellow bloggers/judges. Finally find parking. Fellow bloggers/judges are three-quarters of the way thru meeting and judging participants. Teri Haler to the rescue. She provides me judge’s badge and clip board. I look official. After just 5 booths I run into my fellow bloggers/judges. They have judged and tallied their votes. So . . .? No, Taste of Conyers I am not judging you. How could I? But from what I did see of you I look forward to next year’s invite to judge. The fact that it took me forever to find parking tells me it was well received. And the booths I did get to visit showed that they were in it for the win. The crowds that I passed through tells me that small town Conyers ain’t so small anymore. Everyone is going to want to be in the place to be next year . . . Taste of Conyers. As for the rest of my day, I had a good time at my family’s community event. I was present and accounted for! I even tried my hand at a game of trying to get an Oreo cookie in my mouth by using my facial muscles. So much harder than you think, Know that the tired chef didn’t win. Afterwards, I didn’t go home and rest. I ended up at a Cinco de Mayo party. I would find rest on another day. I still managed to make it a day of memories. Food, Family and friends. How could I not? 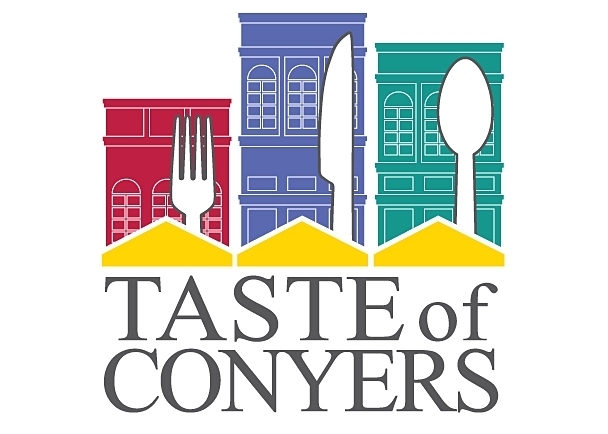 I hope you’ll consider attending next year’s Taste of Conyers so you can make some wonderful memories of your own. If you don’t know anything about Conyers, check out my post about the tour I took of my new hometown here.